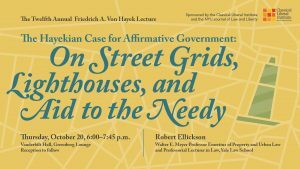 We are pleased to invite you to the Twelfth Annual Friedrich A. von Hayek Lecture, featuring Robert C. Ellickson, Walter E. Meyer Professor Emeritus of Property and Urban Law and Professorial Lecturer in Law at Yale Law School. Professor Ellickson will deliver the evening’s keynote address titled “The Hayekian Case for Affirmative Government: On Street Grids, Lighthouses, and Aid to the Needy.” Trevor Morrison, Dean and Eric M. and Laurie B. Roth Professor of Law, NYU Law, and Richard Epstein, Laurence A. Tisch Professor of Law, NYU Law, will make introductory remarks. The event is jointly sponsored by the Classical Liberal Institute at NYU Law and the New York University Journal of Law and Liberty and will be held on Thursday, October 20, 2016 from 6:00 to 7:45 p.m. in Vanderbilt Hall, Greenberg Lounge, located at 40 Washington Square South. A reception will immediately follow the lecture. This event has been approved for 1.5 New York State CLE credits in the Areas of Professional Practice category. It will be appropriate for both experienced and newly attorneys (those admitted to the New York Bar for less than two years) and is presented in traditional (in person) format. Robert C. Ellickson has been Walter E. Meyer Professor of Property and Urban Law at Yale Law School since 1988. He formerly was a member of the law faculties at USC and Stanford. His major research interests, as the title of his chair suggests, are property, land use, housing, urban history, and social norms. He also is a veteran teacher of torts. He has been a visiting professor at the Harvard and University of Chicago Law Schools. Professor Ellickson’s books include The Household: Informal Order Around the Hearth (2008), Order Without Law: How Neighbors Settle Disputes (1991) (awarded the Order of the Coif Triennial Book Award in 1996), Land Use Controls: Cases and Materials (3rd edition 2005, with Vicki L. Been), and Perspectives on Property Law (3rd edition 2002, with Carol M. Rose and Bruce A. Ackerman). He has published numerous articles in legal and public policy journals on topics such as land use and housing policy, land tenure systems, homelessness, and the organization of households, community associations, and cities. On account of his interest in the history of the development of property institutions, he has written about ancient systems of land tenure and also periodically teaches a seminar on the history of development of the City of New Haven. Robert Ellickson was a founding member and later a director of the American Law and Economics Association, and served as its President in 2000–01. In 1986–98 he was an adviser to the American Law Institute during its preparation of the Restatement, Third, Property—Servitudes. He is a fellow of the American Academy of Arts and Sciences. At the Yale Law School he has served as Deputy Dean (1991–92) and, during the reconstruction of the Sterling Law buildings, as chairman of the Building Committee. As is the custom with the Hayek lectures, Professor Ellickson’s lecture will be published in the New York University Journal of Law and Liberty. The Hayek lecture series has addressed many different topics since its inception, but it remains true to its mission: to challenge audiences to help shape a better world. If you have any questions, please contact Eva Dorrough, Program Manager, Classical Liberal Institute, at eva.dorrough@nyu.edu.